The Multi Quick 5 Baby hand blender is extra lightweight and has an ergonomic, slim and soft-grip handle for maximum convenience - especially when blending big portions of baby food. 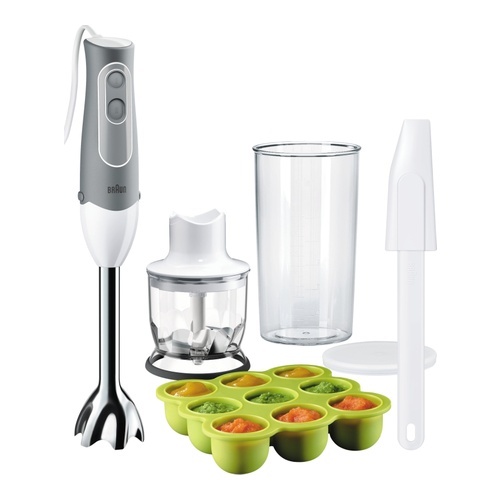 The Multi Quick 5 Baby hand blender gives you controllable and powerful blending with Powerbell Plus technology and 2 speed control for single handed use. Along with the hand blender, you get a chopper, a freezer container and a 600ml BPA-free plastic beaker with ml and fl oz measurements including lid and spatula. The Multi Quick 5 Baby hand blender is exstra lightweight, with ergonomic, slim and soft-grip handle for maximum convenience, especially when blending big portions of baby food. It comes with a chopper, a freezer container and a 600ml BPA-free beaker including lid and spatula.